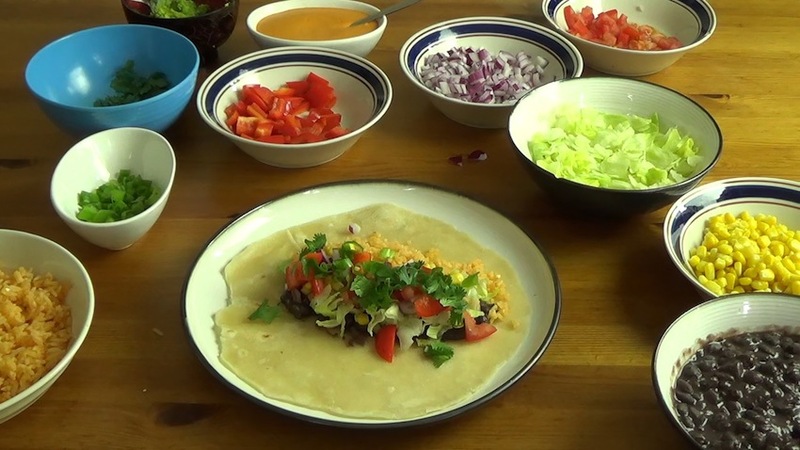 I've been working on the individual ingredients for this vegan bean burrito for the past few blog posts. Today, we finally get to put it all together and chow down. The series started with a tangy vegan chipotle sauce that resembles mayo a bit, and to that we added a simple but flavourful Spanish rice. 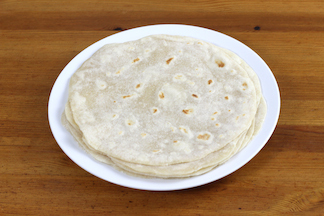 Most recently, we took a stab at making flour tortillas from scratch. 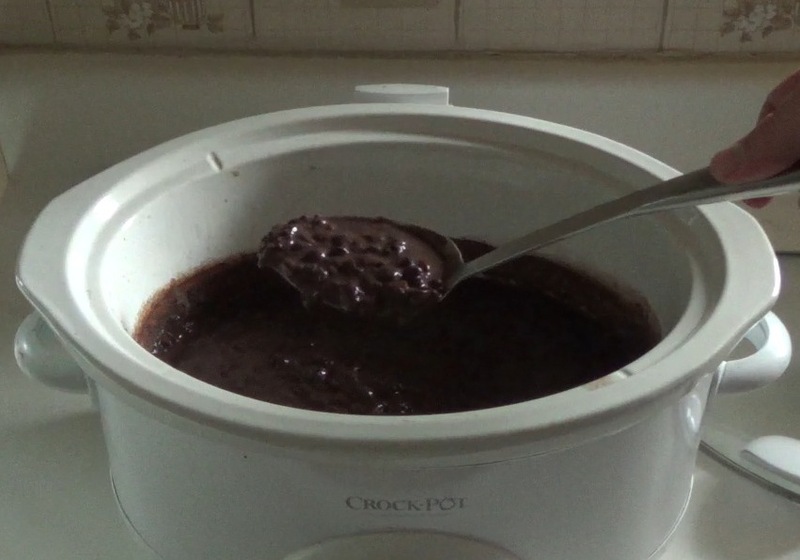 To top things off, we'll make some slowcooker black beans and put everything together with some delicious veggies, mashed avocado and (optional) cilantro. I should say that you can find perfectly fine storebought vegan alternatives for any or all of these ingredients. 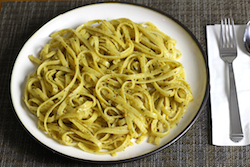 If you have the time, I hope you'll consider making as much of it in your own kitchen as possible. 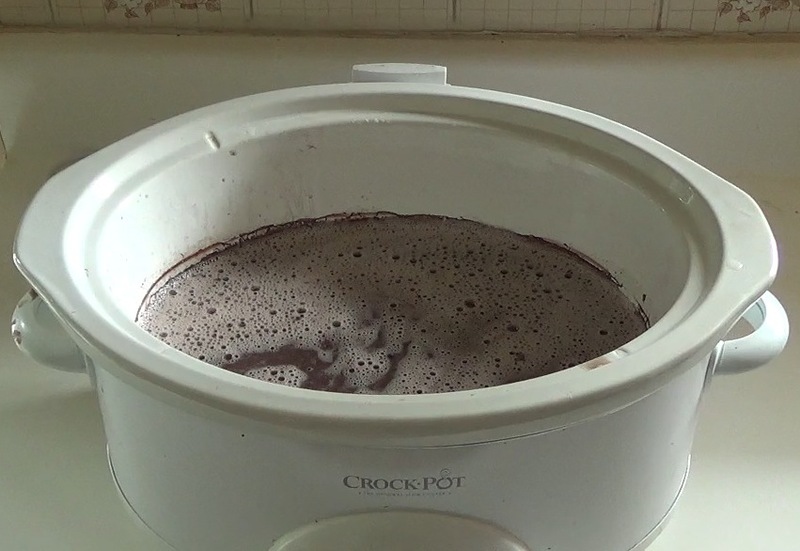 I find myself getting more and more attached to the DIY aspects of vegan cooking as time goes on. 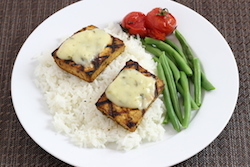 I don't know if the food actually tastes more vibrant and flavourful this way, but my mind seems to believe it does, and psychology is a huge part of wholesome eating. At least it is for me. Speaking of vibrant, the vegetables really take this burrito from an acceptable meal to a tube of happiness on a plate. The sweet corn and red peppers in particular contrast beautifully with the other ingredients and provide a satisfying crunch. 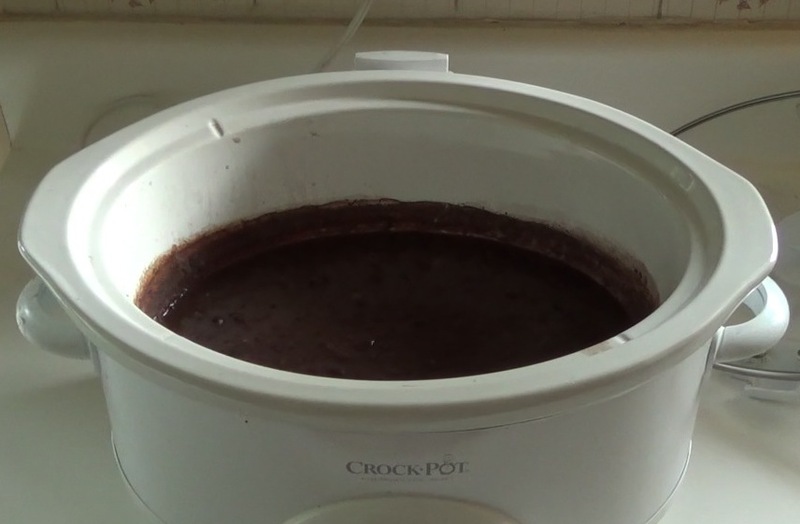 Having made them crammed full of veggies, I can't imagine making them any other way. Making the beans is very simple, it just takes time. 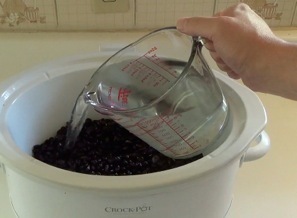 Start by soaking the beans overnight, the night before you want to make them. The next day, just place the beans and water in a slowcooker and cook on high for 6 hours. After 6 hours, they should still be largely intact, but tender. Add the salt and mix well. Turn off the heat and let them cool a little bit. 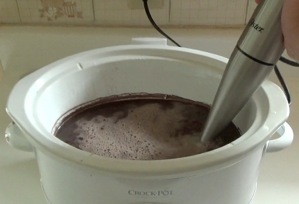 After they have cooled slightly, mash about 1/4 of them. 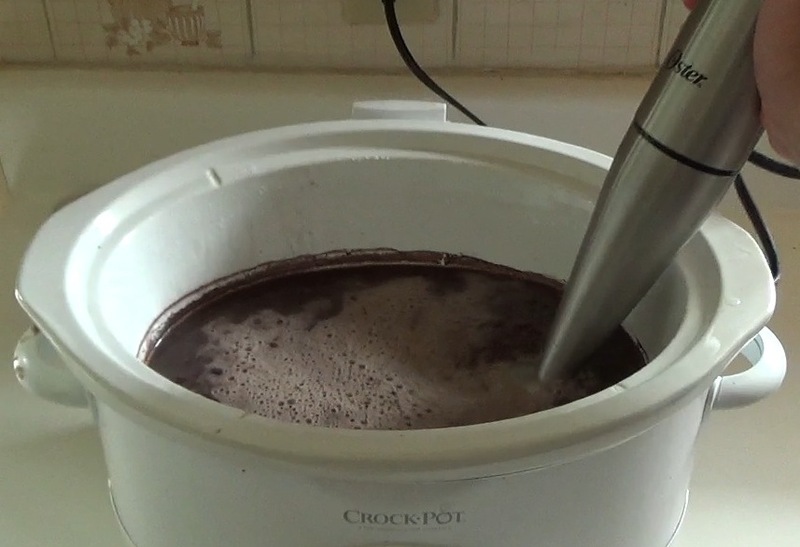 I find an immersion blender works really well for this job, but I imagine that you could get the same result by removing a cup or two of the mixture and placing it a blender (as long as you let it cool enough first) then returning the blended mixture to the slowcooker. 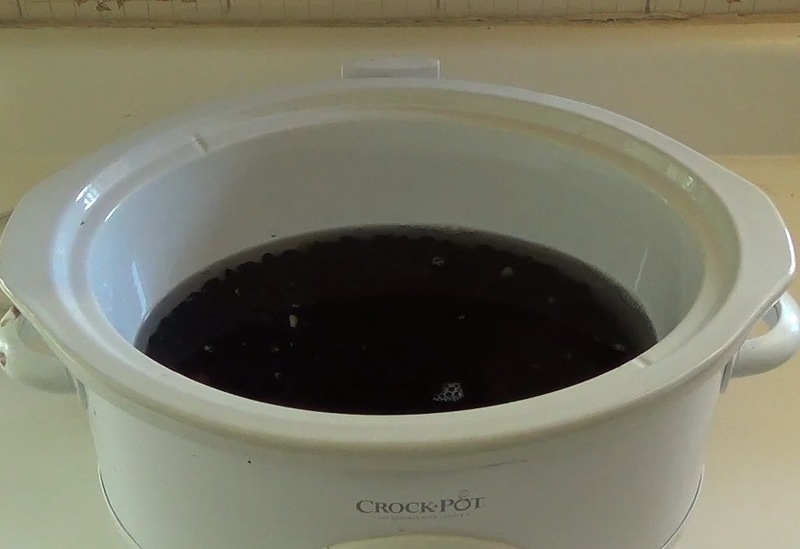 You won't have a thick sauce at this point, but it will thicken with some additional cooking. Turn the slowcooker back on high for another 3 hours, stirring occasionally. I sometimes leave the lid off to help it reduce. 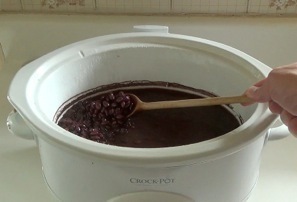 Prep the other ingredients while the beans are thickening. At the end of cooking, you should have a tender beans in a fairly rich sauce that will stay put in the tortilla. Now the hard work is done, and it's time to assemble some burritos. 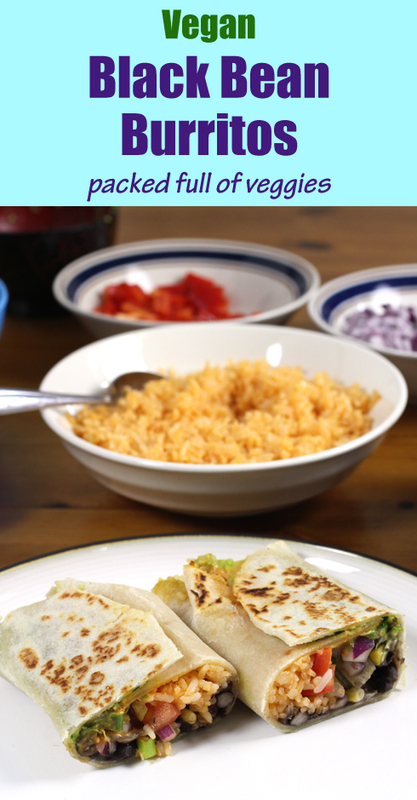 Put a griddle or large skillet on medium heat for sealing the burritos. 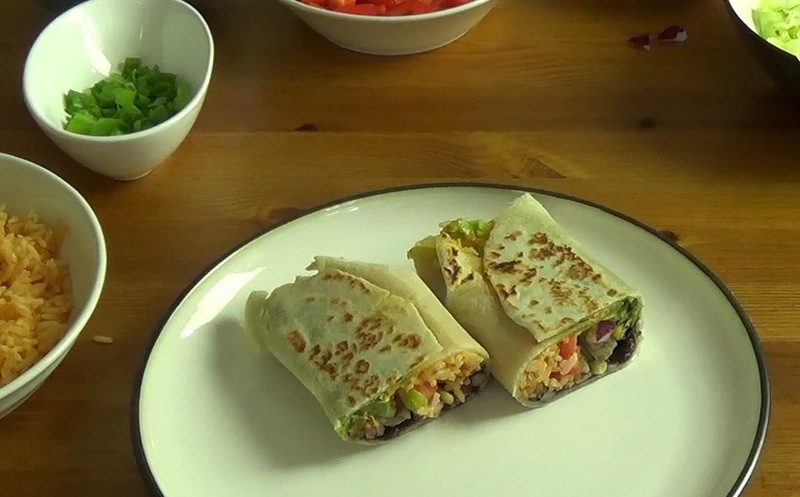 To assemble a burrito, first place a tortilla on the plate. You may notice that one side of the tortilla has brown spots and the other has few if any. 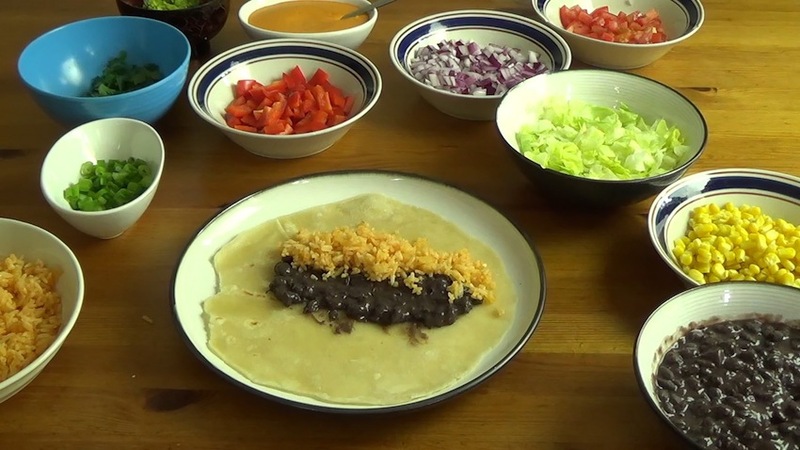 Place the side with the brown spots down on the plate so that it is on the outside of the burrito. Start with beans and rice. 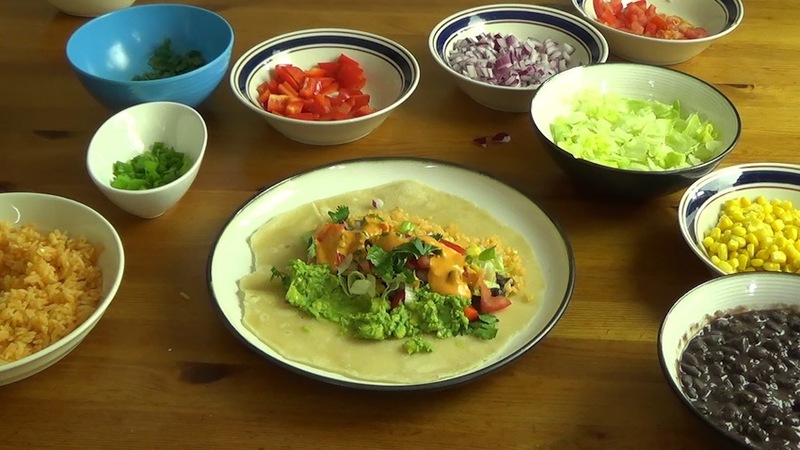 You'll quickly get an idea for how much you can use and still have a burrito that you can roll, but the rule of thumb is that a little goes a long way. 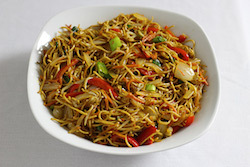 Next add veggies to your heart's content. They really are the star of the show. Green onions are always noticeable no matter what else the burrito has. If you like cilantro, it's a beautiful addition. I like not having to chop the leaves for once—you can sprinkle them on whole. Finally, a little mashed avocado and a heathy drizzle of chipotle sauce round out the experience. Rolling is a bit of a challenge, made a little easier if you've been able to hold back a bit on the filling quantities. 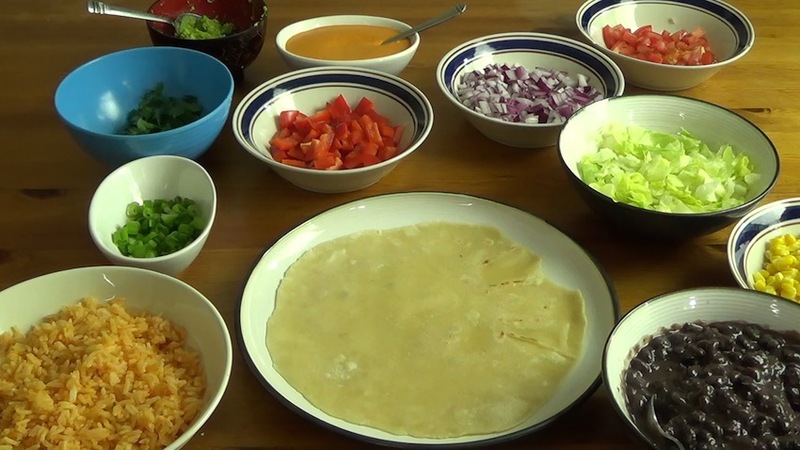 Fold the edges that will become the ends of the burrito in overtop of the fillings, and while holding those pieces there, use your thumbs to roll the edge of the tortilla closest to you overtop. Continue rolling until the burrito is done. 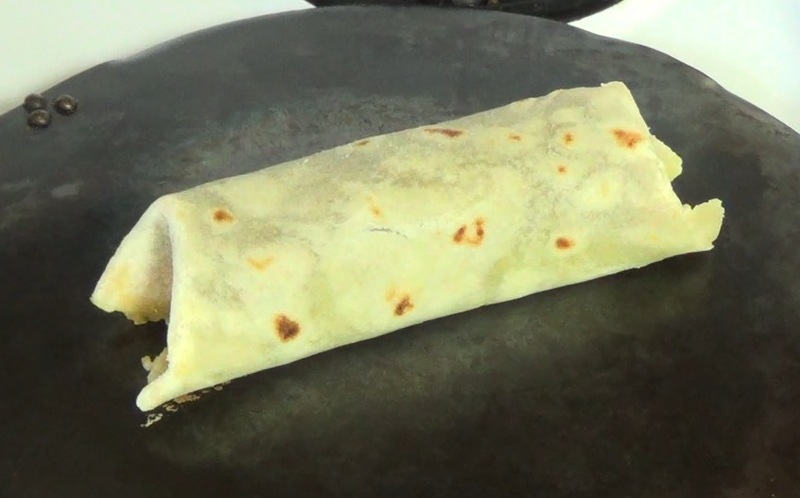 Place the burrito seam side down on the griddle surface for a minute or two to seal. And that's it! I have to say, this burrito makes me just as happy as any vegan burrito I've ordered at a restaurant. I think I owe that mostly to the vegetables, but the fresh tortilla, fragrant rice and tangy chipotle sauce are definite contributors. It's filling and wholesome at the same time. Hope you enjoy.